Check the OMA tube is clean by wiping inside and out with a clean cloth. Place the OMA sample tube on a flat service. Ensure that the tube is not in direct sunlight. 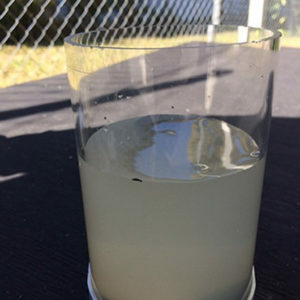 Collect a minimum of 500ml of the effluent that you wish to sample. It is best not to use the OMA tube. Remove the cap with the aperture hole and pour the sample water into the OMA tube up to the level line on the side. 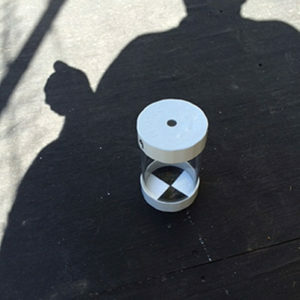 With the cap with the aperture hole at the top, place the lens of the camera over the hole and position the red cross so that it is approximately in the centre of the Secchi disk. Most smart devices will display a focus box. Ensure the OMA tube is still sitting on a flat surface, in the shade or your shadow and with the sample filled to the level line. Place the cap on the tube and select ‘camera’ on your smart device. Place the lens of the camera over the hole as you did for the baseline photo and position the image on your device so that it is in the centre of the aperture hole. NOTE: If you cannot see the Secchi disk in the image on your device, you still need to take the photo to allow the device to compare minute variations in the image. The OMA app will display a focus indicator. Take the photo and accept the image. OMA algorithms will automatically analyse this image to the baseline photo of the empty tube (Step 4) and return an indicative value for the Total Suspended Solids (TSS) to the screen of your device. This image will be automatically stored. You can now enter comments on the condition of the facility and / or land-application area. You can also provide any advice to the facility owner, such as “the facility requires pump out” and have this recorded on the database along with the sample results. In this way, the OMA app builds a comprehensive service and operation history of every facility. If a test is not completed when it is due, OMA will return an “Overdue Service” reminder in the database. It is best to enter facility sites when in a good reception area. This can be done when not on site. NOTE: OMA will not allow the entry of a new facility site if you do not have good mobile reception. With the facility site already in the My Clients site screen, you can conduct and submit a test with no reception. Testing of a facility will only be allowed when on site. This is due to the GPS co-ordinates against the facility address. The test must be submitted before leaving the address. If the facility being tested has above-ground disposal, you will need to enter the Mg/l of Chlorine from 0.0 to 3 m/gl. It will flag red if outside the required range of 0.5 to 2 mg/l. This indicates unsafe chlorine levels if below 0.5 or that the chlorine may run out before the next service if it is dosing at more than 2mg/l. High chlorine levels will impact the environment and kill grass and beneficial bacteria in the soil. All facilities are impacted by poor sludge management. After measuring the sludge level, you enter the percentage of sludge using the level picker. A level 60% or higher indicates the need for the septic tank or facility to be pumped out as soon as possible. You will also be able to select a picker to give the customer due warning if a pump will soon be required. If the disposal area requires attention, detailed comments can be entered in the comment field. The OMA App, or Onsite Management App, has been developed to provide a cost-effective, real-time method of assessing the efficiency of individual Onsite Wastewater Treatment Systems (AWTS) to meet the desired goal of safe sewerage treatment on un-sewered properties. It also builds a detailed historic database of the system’s performance over time. OMA uses a patent pending method of capturing and analysing a sample of effluent from the treatment system and returning an indicator of the water quality being discharged from the treatment system. This is measured against a scale of pre-programmed parameters derived from Laboratory testing. OMA will return a value between 10 milligrams per litre to over 40 milligrams per litre TSS – turbidity. Used with the OMA sample tube (a clear acrylic tube with a secchi disc located in the bottom of the tube) a baseline photo of the Secchi Disc is taken through the aperture opening in the top of the sample tube. This photo is assigned a value and recorded. The sample is then added to the tube and a second photo of the secchi disc is taken. 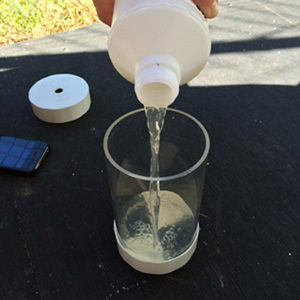 The OMA algorithms compare the level of turbidity and or suspended solids in the sample against the value of the baseline photo of the secchi disc. Using custom algorithms, the app returns an indicator to the screen. The OMA app records this data to the address entered into the device. When entering new addresses the app uses the longitude and latitude of the device and provides a suggestion list of addresses for the person testing the sample to select. This function prevents errors in spelling and doubling up of addresses in the database by producing a list of properties on the nearest named road from GPS data. 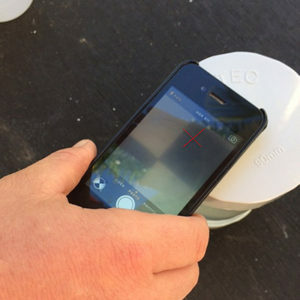 The OMA app returns a value to the screen of the device when a successful image of the sample has been captured. It allows the user to enter comments on issues regarding the waste-water treatment system’s operation and the disposal area. It also allows for information or directions given to the system owner to be recorded with the photos on the database before submitting. Technology at its finest, the OMA solution, is one of the best examples of local authorities and private enterprise working together to deliver real innovation. It makes the legislated requirement for reporting and monitoring of waste water treatment systems simple and effective.